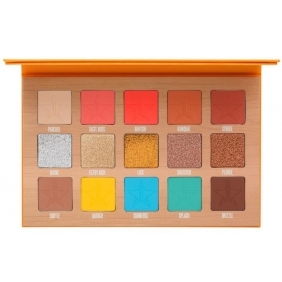 Introducing the Thirsty Palette from the 2018 Summer Collection! Featuring 10 blendable mattes and 5 blinding ultra-metallics in a brand new formula! These shadows are softer than ever with minimum fallout, in an array of bright shades and neutrals to mix and match for all your summer looks. description:wholesale makeup|wholesale cosmetics|cheap brand makeup Jeffree Star Thirsty Palette  - Introducing the Thirsty Palette from the 2018 Summer Collection! Featuring 10 blendable mattes and 5 blinding ultra-metallics in a brand new formula! These shadows are softer than ever with minimum fallout, in an array of bright shades and neutrals to mix and match for all your summer looks.